some come with a bamboo bottom. 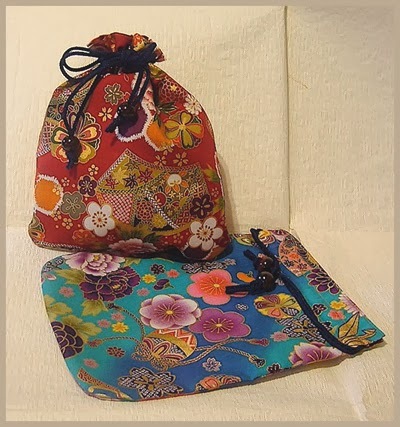 for takarabukuro 宝袋 "treasure bag"
Kinchaku is a traditional Japanese purses or handbags. 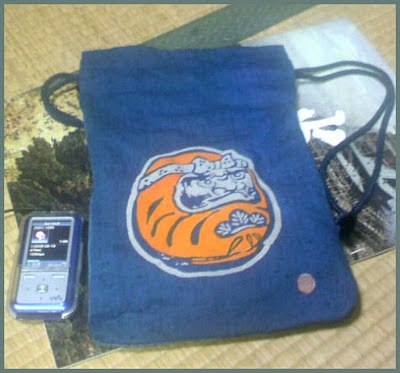 It is a small bag, typically with a drawstring. Kin means fabric and Chaku means to put on. 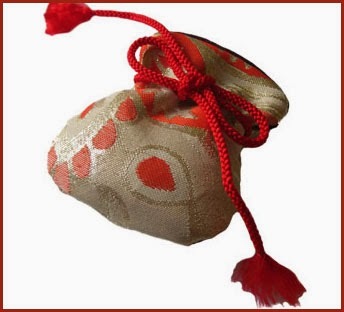 This small drawstring bag was invented to carry personal things such as money, one’s seal impression, a lucky charm, medicine, cigarette and cosmetics close to your skin. It also was used to carry Bento (lunch box) and utensils around. 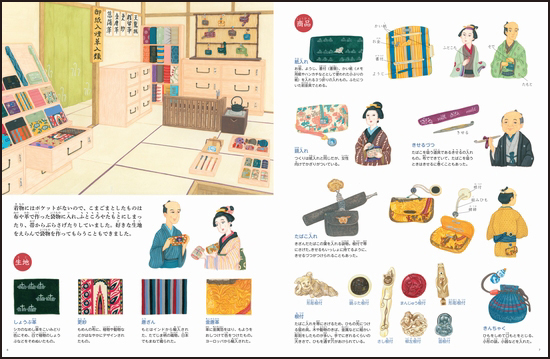 In Edo Era, Kinchaku became a fashion icon in rich people and high-end Kinchaku were made by professional crafters by using leather, imported woolen cloth and silk. It was a primary accessory to carry around. When Meiji Period arrived, the life style gradually became westernized as Sakoku (locked country) policy has ended and foreigners were free to come into Japan and Japanese finally got permission from government to travel to oversea. 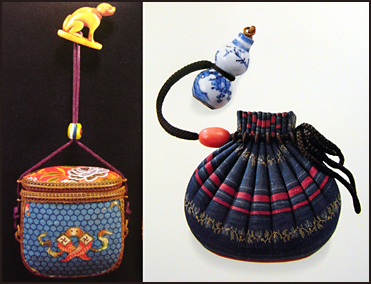 People were rapidly fascinated with western cultures and the Kinchaku was replaced with other types of bags. 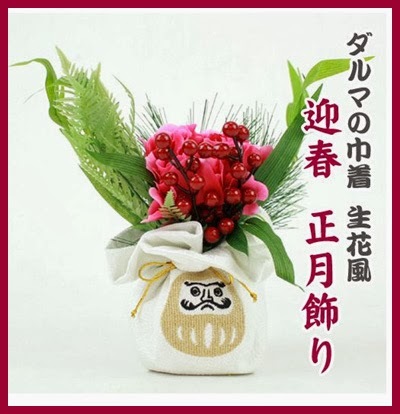 New Year Decoration and Good Luck !
. 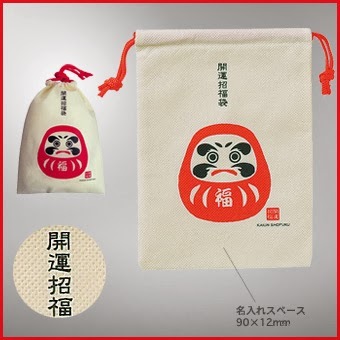 Bakuchi doogu 博打道具入れ gambling tools . 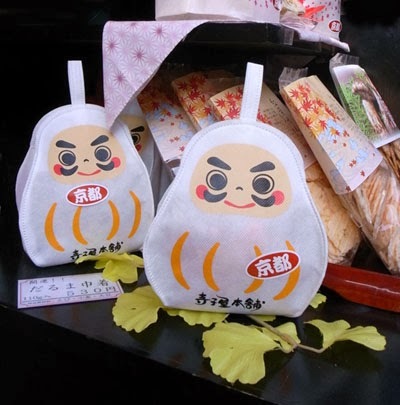 Photo from Nakamura Daruma san.
. sweets from Kyoto .
. Kuroda Kanbei Yoshitaka 黒田官兵衛 孝高 . To keep the "money", this bell does not have an opening at the bottom and does not make a sound.
. Amulets and Folk Art from Osaka .
. Hotei 布袋 Pu-Tai with the treasure bag . 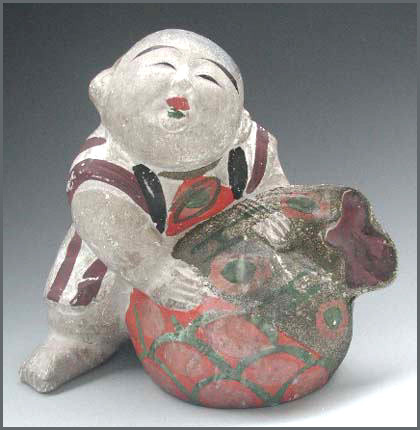 Hotei is also called the ”Deity with the Treasure Bag” 宝袋尊. 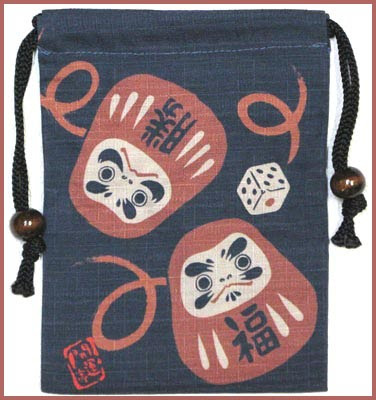 This bag often comes alone as a symbol for good luck and good business. May all the money gather in this bag. 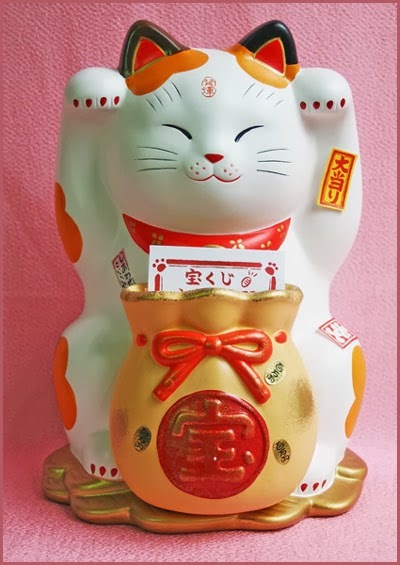 This treasure bag of the cat helps to win the lottery !
. takarakuji 宝くじ lottery . 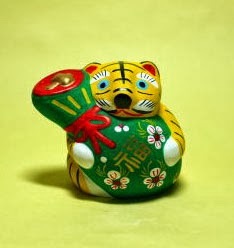 A tiger embracing the treasure bag. 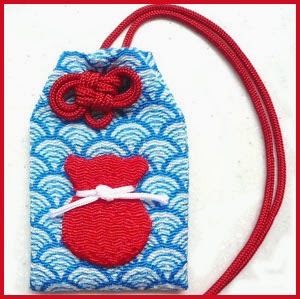 May the girl always have money in her purse and have a rich heart to embrace all good and bad things.
. Hookaiji no takarabukuro omamori 宝戒寺の宝袋お守り - treasure bag talisman .
. omamori　御守り　amulets and talismans . Not to be confused with bokken. The word "shinai" is derived from the verb shinau (撓う), meaning "to bend, to flex", and was originally short for shinai-take (flexible bamboo). Shinai is written with the kanji 竹刀, meaning "bamboo sword", and is an irregular kanji reading. 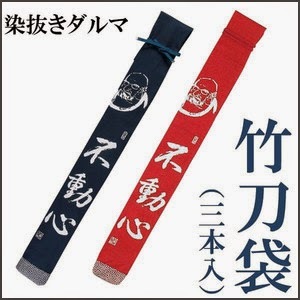 In kendo, it is most common to use a single shinai, sometimes called itto style. Some kendoka choose to use two shinai. CLICK for more photos of fukuro-mono ! 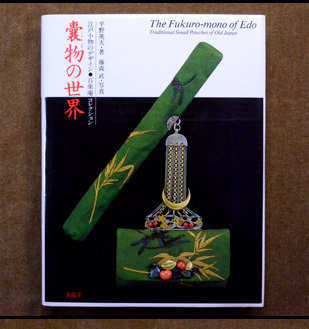 They use mostly cloth and leather to produce all kinds of small pouches for the fashionable Edokko. Most important were money pouches and tobacco pouches. They often worked by order from a client to suit his taste. 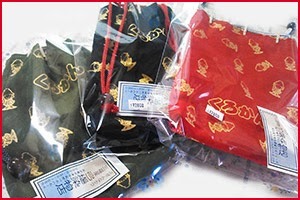 One of the most famous one's was Echikawa　越川.
. tabako-ire 煙草入れ tobacco pouch . 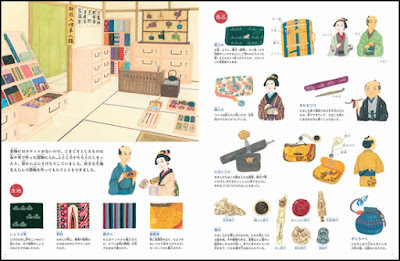 mimibukuro 耳袋 Mimi Bukuro, Mimi-Bukuro "Tales Heard"
"Mimibukuro" is a book written by Moriyasu Negishi in the Edo-period. M. Negishi (1737-1815) was a magistrate in the city of Edo. 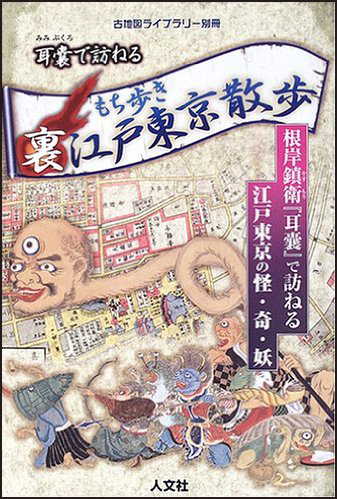 Medical treatment and folk medicine recorded in "Mimibukuro"
He was very much interested in listening to and recording many kinds of the stories, which were told by various kinds of people, such as public officers, samurais, merchants, doctors, etc. Among the stories of this book, there are found some stories concerning folk medicine, medicinal substances and charms. In this report, I studied such kinds of the stories. As the results of my studies, I have shown that some medicinal stories originated in the old Chinese medical books. 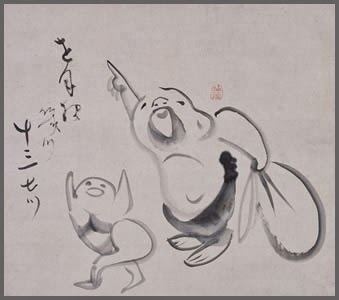 Other stories were supposed to have been popular among the people of Edo. Walking the backstreets of Edo with the Mimibukuro stories.
. Mingei　民芸 Japanese Folk Art .
. tabi 足袋 と伝説 Legends about Tabi socks .
. . . CLICK here for TABI Photos ! 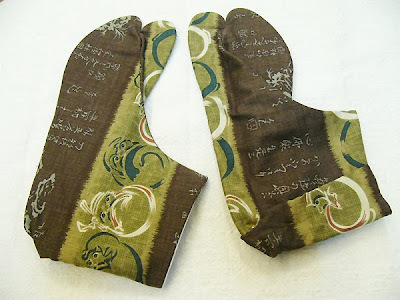 tabi 単皮 （たび）were originally made of deer skin, the use of the Chinese characters 足袋 came later. tabi 多鼻 "many noses", because the big toes stuck out like that. 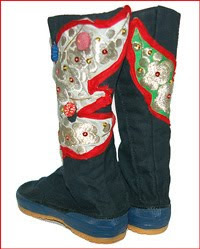 The fore-runner of Tabi, the 下沓　/ 襪　Shitauzu, were used by the aristocracy and soon made of silk, to keep the feet warm in winter. 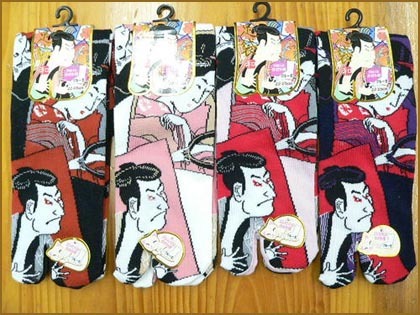 are traditional Japanese socks. Ankle high and with a separation between the big toe and other toes, they are worn by both men and women with zori, geta, and other traditional thonged footwear. 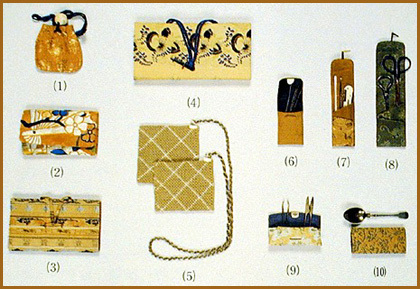 Tabi are also essential with traditional clothing—kimono and other wafuku. The most common colour is white, and white tabi are worn in formal situations such as at tea ceremonies. 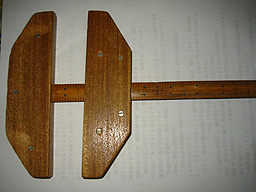 Construction workers, farmers and gardeners, rickshaw-pullers, and other workmen often wear a type of tabi called jika-tabi (地下足袋 tabi that contact the ground). Made of heavier, tougher material and often having rubber soles, jika-tabi resemble boots and are outer footwear rather than socks. Like other tabi, jika-tabi are toe-divided so they can be worn with slip-on thonged footwear. Shōjirō Ishibashi, the founder of major tire company Bridgestone Corporation, is credited with their innovation. 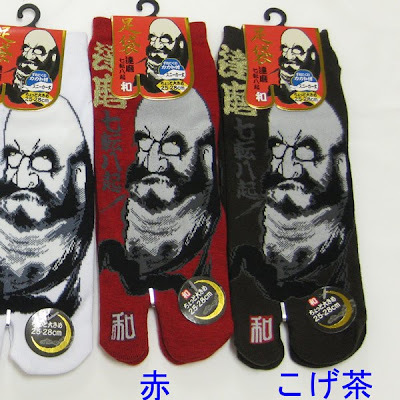 ..... With all this footwear, one wears tabi socks, designed to be worn with thong toes, unless wearing a casual, cotton yukata kimono, in which case one does not wear tabi. Another exception is the waraji sandals, often worn without tabi, especially by workers in rural areas. The older style of tabi is non-stretch, with kohaze fasteners, and the more contemporary style is stretchy and without fasteners. Shoes are removed when entering a Japanese home; one walks on their scrupulously clean floors in one’s tabi socks or a pair of indoor tatami sandals. You can see tabi being worn in the photo at the very top of this footwear blog post, with the black zori. 脚絆　/ 脚半 kyahan, to wear under tabi. are socks that have been knitted so that each toe is individually encased the same way that fingers are individually encased in a glove. All sock lengths are available as toe socks, from anklet and ankle socks through to knee-high and over-knee socks. They are also available with rubber soles. 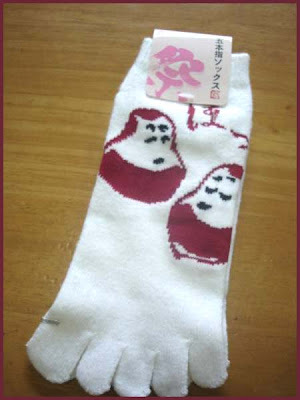 Toe socks came into popularity in the 1970s and made a comeback in the 1990s as a novelty item worn by adolescents. These later socks are usually almost knee high, striped, and sometimes worn with flip-flops to make a fashion statement. a kind of black shoe for workers, now fashionable with the young ones. Some have quite a fancy design, click on the thumbnail below. 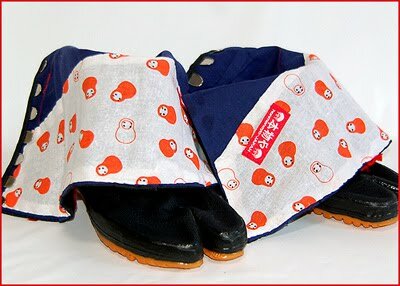 The inside of the tabi called Kin Kakuji (golden temple) boots have been lined with Japanese fabric showing off the Honmonoya red label and featuring daruma. 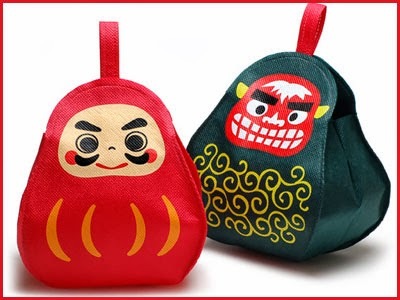 Daruma are Japanese wishing dolls. These tabi are made for dancing or funky street strolling! and you won't be able to attend your parents' deathbed". Now the saying may be said to be rather a superstition. Though he knew well what the old saying meant, the night was so cold that he could not help wearing split-toe socks in the bed. That night he did not sleep well, as the dream was very weary. He wonders whether, as the superstitious old saying goes, the tabi did disturb his usual sound sleep. The Poet wrote the Haiku at the age of 53, 1768. Considering his age at death 68, 1783, the Poet was not so aged when he composed the Haiku. Mr. Takahashi comments that the Haiku expresses the lonely sleep of an elderly man leading a wretched life. It can be safely accepted that the man in the Haiku is the Poet himself. His prolific periods started when he was 51, 1766. Two years later, at the age of 53, he must have been active and energetic in daily lives. I hardly agree to Mr. Takahashi's comment in this respect. It will be better to suppose that it was a terribly record cold night. Bare-foot in bed, he couldn't easily get to sleep and with split-toe socks on he happened to have a bad dream. He regretted a little that it was anything but a deep sleep. I think that his way of putting it comes close to expressing actual feelings of commoners as to how they spend a severely cold night. 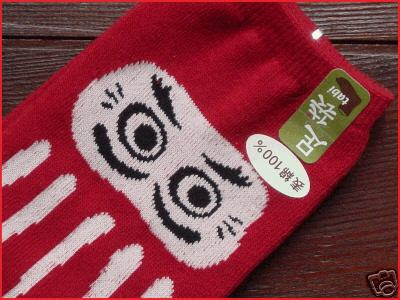 The making of Tabi from cotton began in the Edo period after 1655. Before that they were made from leather and made by specialists 切皮屋　kirikawaya. They were quite expensive, but with the growth of the city population, the need for cheaper footwear became necessary. As cotton was grown more and more, the price for Tabi became reasonable. 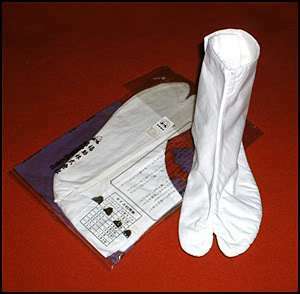 They were made in white for women and black for men and they were not take off when entering a home. Tabi are made of three pieces, the sole, the inpiece (inners) (usually white) and the outer piece (uppers), which soon became a popular fashion item in Edo. But the Tabi makers also sold other items, expecially men's underwear. Since Tabi were only worn in the winter time, the Tabiya was a seasonal worker. Poor folks in Edo did not use Tabi in any season, and the cheap prostitutes were not allowed to wear them at all. There are some Ukiyo-E paintings with barefeet girls in winter, eating soba 蕎麦 hot buckwheat soup by the roadside to keep warm. Tabi were made to order, so the Tabi maker first took measurements of the client's foot. Then he worked on a paper model. The various parts were then cut out with a special knife and sown together by hand. The toes parts were then stripped over a wooden board and hit with a mallet to make them soft. The size of a Tabi is counted in MON　文, since it was measured by placing many MON coins side by side until the size was covered. About 80% of tabi in Japan used to be manufactured in 行田市 Gyoda City、Saitama. The footwear business for travelers flourished because of Gyoda City’s proximity to Nakasendo, one of the five highways of the Edo period and also because cotton – one of the main materials used to make tabi – was produced there. there were almost 300 tabi makers there. But because the custom of wearing tabi was lost with the changing times, the number of tabi makers decreased so that these days there are only 11 remaining.